On 1st August 2014 classes were commenced. On 2nd August 2014 in a ‘Faculty Development Programme’ organized by BMS College of Law, Bangalore, our faculty members, Prof. K. Shivaprasad, Prof. K. S. Hanumaprakash and Prof. G. S. Veena actively participated. On 4th September 2014, Freshers’ Day was celebrated. Hon’ble Justice Y. Bhaskara Rao, Lokayukta, Govt. of Karnataka was the Chief Guest. On 6th September 2014, Te4achers’ Day was grandly celebrated in the college. On 10th and 11th September 2014, the Principal attended Karnataka State Eligibility Test (KSET) Meeting at Mysore University to set the question paper in Law for State Level Eligibility test. On 12th & 13th September 2014, in the Two days National Seminar on the topic “Criminal Law and Justice delivery system in India” organized by M. S. Ramaiah College of Law, Bangalore, our college was represented by our faculty members Prof. K. Shivaprasad and Prof. M. G. Hareesh and some students of 7th Sem of 5 years and 5th sem of 3 years courses. On 16.9.2014, in the SDM Law College, Mangalore organized programme of inauguration of ‘Moot Court Society’, Prof. K. Shivaprasad was the Guest of Honour and delivered a lecture on the topic ‘Moot Court Practices and Legal Profession’. Justice & Care, an international team of human rights professionals supporting victims of trafficking and other forms of injustice, co-ordinates with various institutions in their effort to prevent these crimes, protect the victims and prosecute those who exploit them. In one such of their noble endeavor, Santosh Abraham & Roque Coutinho visited our college on 17th September 2014 and impressed upon our students, the need to spread legal awareness and provide legal aid to the victims. Our students enrolled in large numbers with them to co-ordinate their efforts and pledged to work along with the organization. In the III National Moot Court Competition held at Seshadripuram Law College from 19th to 21st September 2014, our college was represented by a team comprising of Sonam Tshering and Ugyen Choten of IV LL.B. as Mooters and Sangay Dorji of V LL.B. as a Researcher. On 25th September 2014 in the Orientation Programme for Directors of Students’ Welfare and NSS Programme Officers held at Karnataka State Law University, Hubballi, our NSS Co-ordinator, Prof. T. Bayya Reddy participated. On 7th October 2014, the Principal participated in the paper setting and translation process of Karnataka State Eligibility Test Examination at Mysore University. On 14th October 2014 the NSS Unit of our college had organized Vanamahotsava at Maranayakanahalli, Uttanahalli, Jala Hobli, Bangalore North Tq. under the guidance of NSS Co-ordinator Prof. T. Bayya Reddy and Prof. K. S. Hanumaprakash, 63 Law students participated and 205 saplings were planted. The Vice-President of JES & Donor, Sri. S. T. Narayana Gowda inaugurated the programme. In the 17th S. C. Javali Memorial National Moot Court Competition held on 17th & 18th of October 2014 at Karnatak University’s Sir Siddappa Kambli Law College, Dharwad, our college was represented by a team, comprising of Abhiram Kumar Parasara of II LL.B. (3 years course) and Rajesh. P. of V LL.B. (5 years course) as mooters and Ganapathy. K. of III LL.B. (3 years course) as researcher. On 3rd January 2015, the Principal attended the Board of Examiner’s meeting for both P.G. and U.G. courses at Mysore University. On 9th January 2015, the Principal attended Expert Committee meeting of K.S.E.T. at Mysore University. On 13th January 2015, the Principal participated as Chief Guest in ‘College day’ of Sardar Vallababhai Patel P. U. College, Sarjapur, Anekal Taluk. On 23rd January 2015, the Principal attended Syndicate meeting of K.S.L.U. at Hubli. On 29th January 2015, The Principal delivered a lecture on ‘Importance of Legal Education’ at Sri Sampannappa Hostel, Bangalore. On 2nd February 2015, classes for the even semesters of both courses commenced. On 3rd February 2015, the Principal presented a research paper titled “Legal and Ethical Issues of Surrogacy – A Human Rights Approach” in a National Conference on Human Rights, organized by Department of P. G. Studies-in-Law, Karnataka State Open University, Mysore and also chaired a technical session..
From 4th February to 8th February 2015, Prof. M. G. Hareesh and Prof. S. V. Nageshwara Rao actively participated in the National Level Workshop on ‘Family Law Teaching’ organized by Karnataka State Law University, Hubli in association with I. B. A. Chair, National Law School of India University at Hubli. On 13th & 14th February 2015, our students participated and won the following prizes in the K.S.L.U. Zonal Youth Festival organized by the KSLU at Sheshadripuram Law College, Bangalore. On 14th February 2015, Sri. Y. G. Muralidharan, Co-ordinator for CREAT (Consumer Education Research and Training) delivered a ‘Law Forum Lecture’ on the topic “Time Bound Services and Good Governance”. In the Louis M. Brown and Forrest S. Mosten International Client Consultation Competition conducted from 20th – 22nd February, 2015, by the K.L.E. Society’s Law College, Bengaluru, our institution was represented by 2 students: G. Prameela of IV Sem, 3 yrs. Course and A.P. Aryakumar of II Sem 3 yrs. Course. Prof. Kalpana. L., Vice-Principal & Prof. K. Shivaprasad were invited to judge the competitions at KLE Law College on 21st February 2015. In the First Conference for Law students on Legal Education Reforms, conducted by the Menon Institute of Legal Advocacy Training, Trivandrum & IBA – CLE Chair National Law School of India University, Bangalore, on 21st & 22nd of February 2015 at NLSIU, Bangalore, Kinley Pelden Chophel & Kalicharan. G. R. of X Sem presented papers and actively interacted and were much appreciated. On 26th February 2015, N.S.S. Unit of our college headed by Prof. T. Bayya Reddy organized “Swachhatha Andolan Abhiyaan” at our college premises. On 3rd March 2015, Prof. M. G. Hareesh was a resource person in a State Level Symposium on the topic “Cyber Law – effect and challenges” organized by First Grade College, Kengeri, Bangalore, in association with the Karnataka Institute of Law and Parliamentary Reforms at Kengeri Town, Bangalore. On 7th March 2015, Justice N. Kumar, Judge, High Court of Karnataka delivered a Law Forum lecture on the topic “Alternative Disputes Resolution”. On 9th March 2015, the Principal participated in a Expert Committee meeting to revise syllabus for 5 year B.A., LL.B., BBA.,LL.B. and 3 years LL.B. 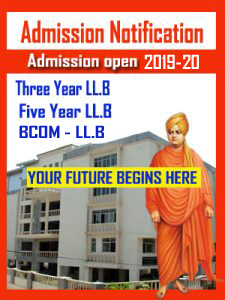 courses at Karnataka State Law University, Hubballi. On 11th March 2015, Annual Sports day was held at Gymkhana Grounds, Indian Institute of Science, Yeshwanthpur and also conducted Inter-class Cricket competition. On 12.3.2015, our Alumna, Anish Kumar Sreedharan, Founder of the NGO MINDKRAFT, conducted a workshop for our students, on the techniques of research & also impressed upon the students, the importance of internship in law. On 18th March 2015, the principal delivered a lecture on “Criminal Law in India” at Vivekananda Degree College. In the Dastur On-line Essay Competition, 2015 for students of Law and Accountancy, conducted by the Chamber of Tax Consultants, Mumbai, Santosh. B. G. of IV Sem 3 years course submitted an Essay (in 7000 words) on 27th February 2015 on the following 3 topics. 1) 10 challenges to be tackled by the Prime Ministers 2) Judicial Activism & 3) Social sites / apps….. kills or builds relationship? On 19th March 2015, the Principal participated in a workshop conducted by District Training Institute, Tumkur on the topic “Right to Information and its Implementation” for the benefit of District Level Officers of Education Department. On 26th March 2015, Darshavardhana. B. G., II Sem (5 years) LL.B. participated in an Elocution Competition on the topic “The Role of law students in good governance” – conducted by Karnataka State Law University, Hubballi. On 27th March 2015, Prof. Dr. N. R. Madhava Menon, Chairperson, IBA Chair, National Law School of India University, delivered Arasanahalli M. Muniswamaiah Memorial Lecture on the topic “Legal Professions in a Globalized World: Some Reflections on the Road Ahead” jointly organized by Janatha Education Society’s Law Forum and Hulkul Muniswamappa Muniventakamma Charitable Trust. On 30th March 2015, the N.S.S. Unit of our college headed by Prof. T. Bayya Reddy, in association with the Rotary Club, Bangalore (T.T.K.) Blood Bank and Alumni Association organized a “Blood Donation Camp” in our college premises. In the 4th National Moot Court Competition 2015 conducted by Bishop Cotton Women’s Christian Law College, Bengaluru, on 28th & 29th of March 2015, our institution was represented by Santosh. B. G. &. Abhiram Kumar of IV Sem 3 years course as mooters and Rajesh. P. of X sem as researcher. On 31st March 2015, R. Ramesha and Vasanthkumar. P. of IV Semester (3 years) LL.B. participated in the 23rd State Level Inter Collegiate Debate Competition conducted by PES Law College, Mandya as a part of Late K. V. Shankara Gowda Centenary Celebrations. On 8th April 2015, Ms. Kalpana. L., Vice-Principal was invited to judge the Inter-Collegiate Seminar on “Human Rights & Theory of Justice” conducted by Bishop Cotton Women’s Christian Law College, Bengaluru. On 8th & 9th April 2015, Sunil and Group (3rd year 3 Years LL.B.) participated and secured 2nd prize in ‘Group Song’ competition in the Finale of Inter Zonal Youth Festival organized by K.S.L.U., Hubballi. On 13th & 14th April 2015, Ragini. B. J. & G. Kiran Rao Sawant of IV Sem 3 Years course represented our institution at the CMR III National Cross Examination Competition conducted at the CMR Law School, Bengaluru. On 16th & 17th April 2015, Inter Class Cultural Competitions were held in the college auditorium.